Gene Taylor, bass; Roy Brooks, drums. Horace Silver. I don't mean to drop names. It's just that my English teacher always told me to get the reader's attention immediately. Horace Silver is one of the best attention-getters I know. Now, Silver has done a succession of fine albums for Blue Note, but this is the first time his group has recorded under on-the-job conditions. Outstanding among Horace's many attributes is his ability to communicate deeply and directly to his audience. Perhaps this positive quality is the cumulative effect of all his best traits. Whatever it is, he can ignite his listeners to a level of healthy excitement. The applause that greets the finish of "Filthy McNasty" is not made by any "jive" audience. These people are genuinely knocked out and they let the group know it. Through the magic of Rudy Van Gelder's portable equipment, the spirit of the entire set is transmitted to you intact. "McNasty" is a new personality in the Silver song & storybook. He may not be "south of the border" like "Se�or Blues," but he is low-down in his own way. Horace introduces him to the gathering at the Gate as "a mythical young man of rather dubious character." As the horns tell the funky little tale in an ear-catching manner, Silver tosses in some colorful pianistic adjectives. He continues to rumble and bubble under Blue Mitchell's sure-fingered solo. If Junior Cook were to legally pluralize his last name, it would read like the baldest statement of fact. Junior cooks and makes no mistake about it. Like a method actor getting into a role, he literally embodies "Filthy McNasty." After Cook's solo, leader Silver leaps in for some of his typical, individually-patterned, head shakin' solo work. To cries of "more," the quintet responds with the second of four new Silver originals, a minor blues entitled "Doin' The Thing." Cook comes catapulting out of the up-tempo ensemble choruses to wail again and Mitchell tuns on the heat in no uncertain manner. Silver keeps the thermometer up during his solo stint before giving way to a short segment of exchanges between the horns. A Roy Brooks drum solo, bristling with electric energy precedes the final theme. "Kiss Me Right" is in a minor groove but it differs in tempo and mood from "Doin' The Thing." Cook and Mitchell are both lyrical without neglecting to swing. That's something no one in this group ever forgets to do. Silver is in a quoting groove and adroitly works in bits from "Joshua Fit The Battle Of Jerico," Bud Powell's "Tempus Fugit" and "Filthy McNasty." The latter reference does not mean that Horace is repeating himself, merely an example of a theme recurring, quite naturally, in a musician's mind during the course of an evening's performance. Horace describes "The Gringo" as being "somewhat in the Latin vein." "Somewhat" is an accurate word, for between the Latin rhythm at the beginning and end, there is driving, slashing, up-tempo 4/4, except for the opening portions of Cook's and Silver's solos. Everyone is in spirited form here. Especially stimulating is Brooks. I like to call him "the tearer-upper" or "the upsetter." You'll know why after hearing his offering here. The ensemble returns after Roy's solo. Dig the little Spanish flourish at the end. One chorus of the quintet's theme, "Cool Eyes," [mp3] serves as a closer to the set. After graduating from the Messengers of Art Blakey, Horace Silver started his own group in September 1956. He has led a quintet with increasing success ever since. The current edition has been together longer than most combos operating in contemporary jazz. Cook, Mitchell and Taylor all joined in 1958. Brooks in September of 1959. In a field where most groups resemble transient hotels, this is an admirable record. It explains why these five men relate so wonderfully well to each other and produce a jazz pulse second to none. While each of the five parts of this group is important, their leader is the focal point. His unquenchable spirit, embodied by both his urgent, percussive comping and the insistent, surging patterns of his solos, is the pilot light for a burner that is one of the most effective cooking units in jazz. It broils, boils, fries, steams and even barbecues with its own built-in, down-home sauce. At The Village Gate, they "burn" on everything. 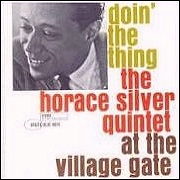 When it comes to "doin' the thing," Horace Silver and the group really know how to do it.